(1) An iconic stainless steel sculpture of a sea bass filled with plastic litter collected by volunteers from local beaches. Local sculptor Gideon Peterson created the structure in partnership with the local community to provide a highly visible reminder of the plastic pollution on our beaches and seas. 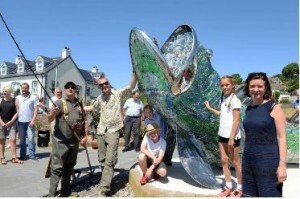 The sculpture “Bertie the Sea Bass” was launched on June 29th 2018 by Eluned Morgan AM (see photo) at its permanent home on Amroth sea front next to the Blue Flag.. 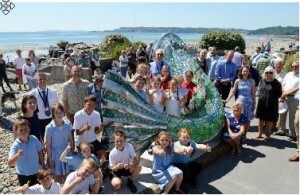 The sculpture is backed up by an associated teaching resource for use by local schools. “Bertie” has now begun a tour of locations on the Pembrokeshire Coast in response to requests from other Community Councils to use the sculpture as a focal point to promote the Clean Seas message. He has visited Saundersfoot and Milford Haven . He will be in Pembroke Dock from the 22nd April and back to Amroth on the 8th July. (2) A Clean Seas Pledge made by both Community Councils and promoted to local business in each Council area. The Clean Seas pledge required businesses in Amroth and Saundersfoot to commit to 3 actions to reduce single use plastic, with each signatory receiving a Clean Seas window sticker (see image). All local food and drink outlets signed up to the pledge and now display the sticker.. The project has enhanced the visitor experience through cleaner beaches, while “Bertie” has become a visitor attraction and demonstrated the power of Community Councils to take action on a critical environmental issue. Amroth Community Council is delighted that they were successful in winning this prestigious Environment Award against other deserving projects. 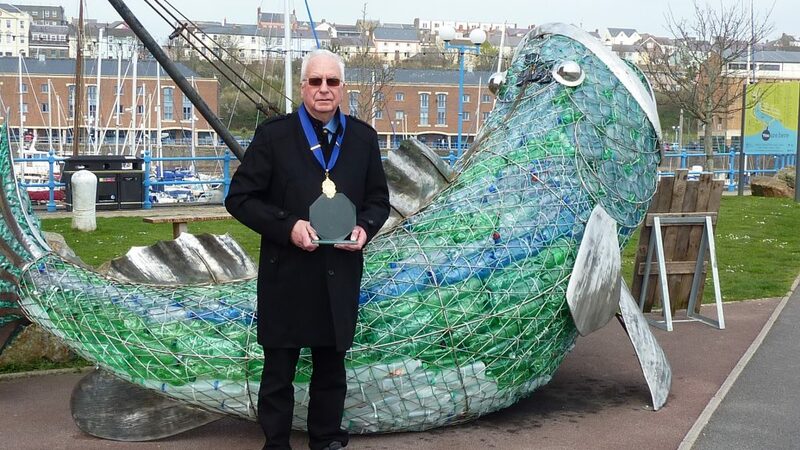 Bertie the Sea Bass is an iconic stainless-steel sculpture filled with plastic litter collected by volunteers from local beaches. Local sculptor Gideon Peterson created the structure in partnership with the local community to provide a highly visible reminder of the plastic pollution on our beaches and seas. Bertie was unveiled on June 29th 2018 by Eluned Morgan AM at its permanent home on Amroth sea front next to the Blue Flag.